Beyond specific questions about how IRE reporters are communicating with their sources is a broader one: What kinds of steps are survey respondents taking to protect their own data, devices, and communications — not just with sources, but with each other? The survey finds that fully half (49%) of all respondents indicate that in the past year they have changed the way they share and store sensitive documents “a lot” (17%) or “some” (32%). Three-in-ten have changed the way they communicate with colleagues. The survey asked about a range of practices these journalists might adopt, such as clearing their browser history, and then separately about a range of tools or software they might use to protect their digital privacy. Half or more of all respondents said they engage in each of five specific practices asked about. 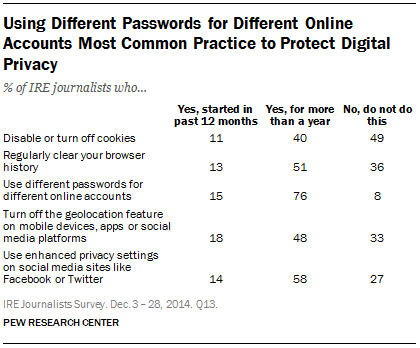 The most commonly used technique is the simple step of using different passwords for different online accounts (91%), followed by changing privacy settings on social network sites (73%) and turning off the geolocation feature on mobile devices (67%). Most respondents who report using these approaches say they have done so for more than a year. Usage of specific tools and software is less common. Half of respondents (50%) do not employ any of the eight measures on their personal or work-issued devices, while just one-in-ten (9%) employ five or more. Three-in-ten (30%) employ one or two.